Well, hello and thanks for stopping by! 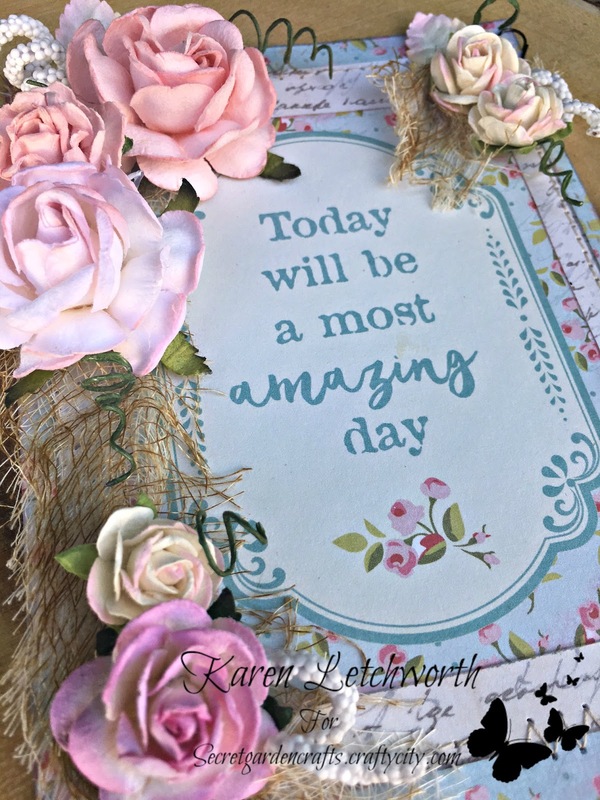 Today is going to be most amazing day......because I'm off on a new adventure as I join the Design Team at Secret Garden Crafts, and I want to thank you for stopping by to share this special and amazing day with me. I'm really excited to share this sweet little shop with you all. And, when I use the word "little", I don't mean it literally by any means. 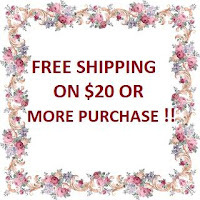 Secret Garden Crafts carries lots of gorgeous paper flowers and embellishments; and its sister store, Crafty City, carries many different soft, romantic pattern paper collections and lots of fabulous Prima products. Everything soft and lovely to help you create something beautiful can be found at Secret Garden Crafts. Oh, and here's a treat for you......there's a SPECIAL OFFER taking place right now. 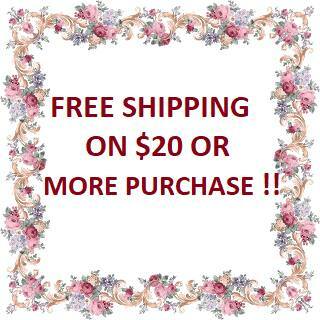 If you order $20+ (US only), you get free shipping! I created this card using a lovely Crafty City patterned paper collection by Julie Nutting called Flea Market. Once I had chosen my patterned papers, I inked their edges and machine stitched them together. Next, I ink stained some cheese cloth and laid it on the left-hand side of my card...kind of pulling it apart just a bit. Then I just started adding several of the GORGEOUS flowers found a Secret Garden Crafts including some Pink Trellis Roses, Pink Cottage Roses, a few Pink and White Mulberry Paper Leaves, and some White Spiral Stamens. Thank you for stopping by today. 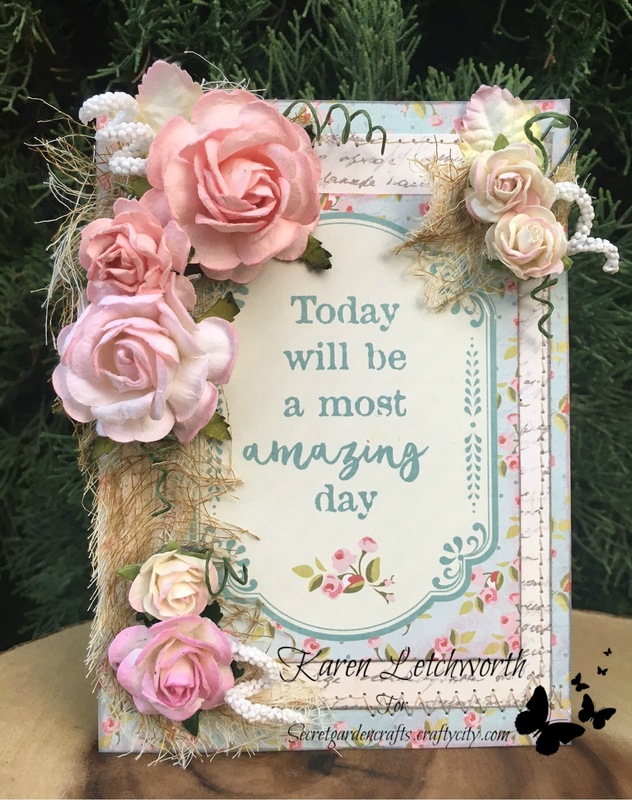 I really hope that you will stop by the Secret Garden Crafts Blog to see all the gorgeous creations by the other DT Members, and also take a moment to visit Secret Garden Crafts to see what they have to offer. It's really quite lovely! Hello Karen: first I must say Congratulations being with another Team Member. yours card is beautiful, you are very talented and very blessed. Karen, your card is GORGEOUS! Just love those flowers and what a beautiful sentiment. Congratulations on your DT - you will be a wonderful asset. What a pretty card, Karen! So happy to see you as a fellow design team member at Secret Garden Crafts! I've never been on a design team before so I am so excited and happy to work with such wonderful product. Your card is Beautiful!I love the pretty flowers, papers, and the lovely sentiment too! Such a beautiful card! I love how soft and delicate it is and the saying is so inspiring! Have a great day! Karen, please email me at cutitupchallenges@gmail.com about your prize. Oh Karen, congratulations on your new team, and what a beautiful card - its delicious!